Mine is a 250 Hensim, I sure do love it. It looks cool, lightweight, easy to handle, black and chrome with saddle bags and handle fringe. Looks like a small Harley, but not. It's cheap on fuel, 70 MPG's and cost was also cheap, which means I bought it myself. I love to ride every chance I get. Can't wait for summer. I do believe I'll let my hair down. Oh yeah, can't you feel it? were do you get parts for 2008 hensim 250cr I need a gear cable ??????????????? do you know where to find parts for 2008 hensim 250cc motorcycle. Looking for spark plugs. I have a 2007 Hensim motorcycle Enduro 250cc.Motor runs great, low miles. Selling all parts. Call Terry 909-528-7985(I'm in Fortuna, Ca. I stumbled on your site while looking for pictures of my new bike. Does anyone happen to know what happened to the importer? I traded my scooter for this bike. It had a fair amount of damage from running into a tree. While looking for parts I stumbled on an ebay seller that had a bunch of Rebel clone parts. As it turns out they had bought out the Hensim warehouse after they ran into legal/financial trouble. I guess I should have asked them what had happened to Hensim, but it didn't occur to ask until later. Fortunately for me they had all the parts I needed to get the bike back into proper condition. What is everyone else doing about parts for these bikes? 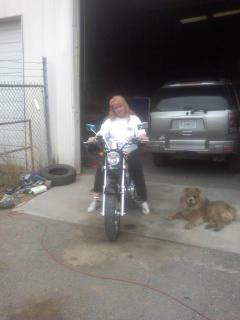 Looking again at the pic of your bike, I see you do have sissy bar. Nice one too! You can put a nice bag on the front or back of the sissy bar. That's a very good looking bike! You can buy bags, like roll bags, that tie to the sissy bar if you have one. Or you can secure one to a fender rack. I've never heard of a Hensim. Who makes that? Your description of your bike reminded me of my hope to find saddle bags to fit my small bike, a Suzuki S40. Even though it is a 650, the bikes physical size is small, weighs a bit over 300 lbs and has a short frame (in length). So, not much room for bags, but it is a drag always having to wear a backpack if I need to pick up anything more than my cell and drivers license when I ride. Any suggestions for finding saddle bags suitable for a small bike that don't break the bank? I decided I wanted to buy myself a bike. You know one that fit me, one I felt comfortable with. I've had bigger bikes but, it's been a long time since I had ridden one,(many many many years). So, anyway I wanted a new bike just for me. I picked it out and I paid for it myself. My husband even said my bike was tough. I read on one forum that someone said don't buy a 250 or a small bike like that but I'm here to say, I love my little black beauty. It makes my day when it's warm outside and I step on my bike and row on and on and on. You see my sweet little ride gets 70 miles to the gal, how bout you? 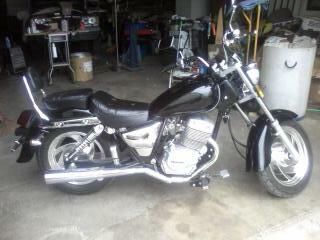 Hey I mean mine is beautiful, all black and chrome, black and silver saddle bags, duck tail fenders. Sometimes less is more, and I got it all. I also like mine. Bought new Nov. of 2011 now have 3500 miles on it. I have had a few problems but I still like it. My speedo is whacked, broke the clutch cable and my kill switch does not work. I got your message and just finally found the picture of your bike. Georgous bike. I saw a 250 Yamaha that is really nice too. We did take the bike to the Honda dealer. Haven't heard back yet. My husband keeps pushing for the bigger bike. I want to enjoy my ride not worry about if I can control the bike if too much power. Anyway, I will get back to you when we hear about the bike at the dealership. Welcome to the site! There are no user accounts or profiles to be able to post on the main site. This allows users the freedom of sharing info without having to give any personal information if they choose not to. There are user profiles in our forum and you will find some very detailed discussions there. How do you see members profiles, or new members, no log in for members? It's a great bike, I have really enjoyed it. I put extra lights on it, a few sparkleys to make it really cute. I just love it. 70 mpg cruises real well, I haven't had any trouble out of it at all, still goin' strong. I just love to ride. I have 250 Hensim. It's a great bike, have a look. I think its cool. I have a Hemsin 250 CR and everything is breaking and falling apart on this bike. I would find a good brand name bike before I thought about buying this bike.